One of the joys of hiking in the late summer and early fall is feasting on wild blueberries and huckleberries. Towards the end of my Appalachian trail thru-hike I feasted on the wild blueberries in Maine, and now that I was nearing the end of my Pacific Crest Trail thru-hike I was feasting on the wild huckleberries in Washington. In the Northeast we take pride in our wild blueberries, and often snub the obviously inferior commercial blueberries. In the Northwest people seemed to take pride in their huckleberries, but they categorically snubbed all blueberries… including the wild Maine blueberries that I thought so highly of. “Are you sure that you’re picking huckleberries and not blueberries,” was a constant, condescending refrain that I’d heard over and over again, and it rankled every time. Though I’d learned how to recognize one species of western huckleberry (Vaccinium membranaceum) and was confident that I was picking huckleberries and not blueberries, there was another question that I wasn’t so sure about: “What is the difference between a huckleberry and a blueberry?” None of the people I talked to really seemed to know. If they didn’t know the difference between a blueberry and a huckleberry, how could they assert the superiority of one over the other? That seemed simple enough, right? Huckleberries are from the genus Gaylussacia and blueberries are from the genus Vaccinium… (Let’s ignore that the second definition of huckleberry is blueberry for now). This definition was consistent with the berries I’d seen on the Appalachian trail, and the colloquial definitions of blueberries and huckleberries that I’d grown up with on the east coast. It also provided the key to telling eastern huckleberries from blueberries while hiking on the Appalachian trail: when you break open an eastern huckleberry, it has 10 chambers and 10 big seeds in it, but when you break open a blueberry it only has five chambers and is full of lots and lots of tiny little seeds. If I was only concerned about the east coast and the AT I’d be done, but what about the berries on the west coast, the berries on the PCT? Do they fit into those same simple definitions? No. According to the united states forest service there are twelve species of huckleberry in Oregon and Washington and they all belong to the genus Vaccinium! That means that by east coast standards (and according to the dictionary definition), all of the western huckleberries are actually blueberries. My initial reaction was to laugh. No wonder why people on the west coast were so confused about the difference between huckleberries and blueberries. I briefly thought about invoking the classic east coast/west coast rivalry, and dismissing all western huckleberries as blueberries, but that didn’t appease my intellectual curiosity… there was definitely something different about western huckleberries… They weren’t the same berries that I’d grown up calling blueberries on the east coast, I needed to learn more. I went searching for a better definition huckleberries and was surprised to find that in at least one state there is a legal definition of a huckleberry! In 2013 the Montana state legislature defined a “huckleberry” as: a berry referring to various wild species of the Vaccinium genus, commonly referred to in this state as a huckleberry or Montana huckleberry. Among these species are Vaccinium membranaceum and Vaccinium globulare. The legal definition gave merit to 2 of the 12 huckleberry species that I’d heard of, and listed four species that were not huckleberries, but it didn’t help me understand the difference between huckleberries and blueberries. I shouldn’t have been surprised that lawmakers didn’t have the definitive answer I was looking for, the definition of a huckleberry is really a question for scientists, not lawmakers. I returned to the literature and to the genus Vaccinium, which includes all of the blueberries, cranberries, and western huckleberries. Since the genus was the same for all of them, I looked to the next level of differentiation, the subgenera. Vaccinium is divided into two subgenera: Oxycoccus (cranberries), and Vaccinium (blueberries and western huckleberries). The subgenera are then further divided into sections. Four of those sections include the berries we call blueberries and western huckleberries: Cyanococcus (blueberries), Myrtillus (bilberries/western huckleberries), Vaccinium, and Pyxothamnus. The majority of western huckleberries are in sec. Myrtillus. I’d finally figured out how to separate the western huckleberries from the blueberry!. I also discovered that in the field (on the PCT) the berry organization can be used to distinguish between the sections: most western huckleberries (sec. Myrtillus) produce single berries on new shoots, the rest of the western huckleberries (sec. Vaccinium and sec. Pyxothamnus) produce small clusters of berries, and the blueberries (sec. Cyanococcus) produce larger clusters of berries on one year old growth. blueberries: the edible blue or blackish berry of any of several North American plants (genus Vaccinium subgenus Vaccinium section Cyanococcus) of the heath family. huckleberries: 1) any of a genus (Gaylussacia) of American shrubs of the heath family; also : the edible dark blue to black usually acid berry (especially of G. baccata) with 10 nutlets. 2) the edible blue or blackish berry of any of several North American plants (genus Vaccinium subgenus Vaccinium section Myrtillus, although plants from sections Vaccinium and Pyxothamnus may also be included) of the heath family. Vaccinium myrtilloides – low bush blueberry. ILLEGAL TO CLASSIFY AS HUCKLEBERRY IN MONTANA. Vaccinium angustifolium (synonym)- low bush blueberry (plants.usda.gov). ILLEGAL TO CLASSIFY AS HUCKLEBERRY IN MONTANA. Vaccinium ashei (synonym)– Rabbiteye Blueberry. ILLEGAL TO CLASSIFY AS HUCKLEBERRY IN MONTANA. Vaccinium uliginosum – alpine bilberry, bilberry, bog bilberry or tundra bilberry (0 ft – 11000 ft ). Vaccinium ovatum – california huckleberry, evergreen huckleberry, blackwinter huckleberry (>0 ft, coastal). Finally, after spending way too much time online, I’d convinced myself that I knew the difference between blueberries and huckleberries both taxonomically and functionally. On paper it was easy, the eastern (AT) huckleberries were the ones in subgenus Gaylussacia, the blueberries (AT & PCT) were the ones in sec. 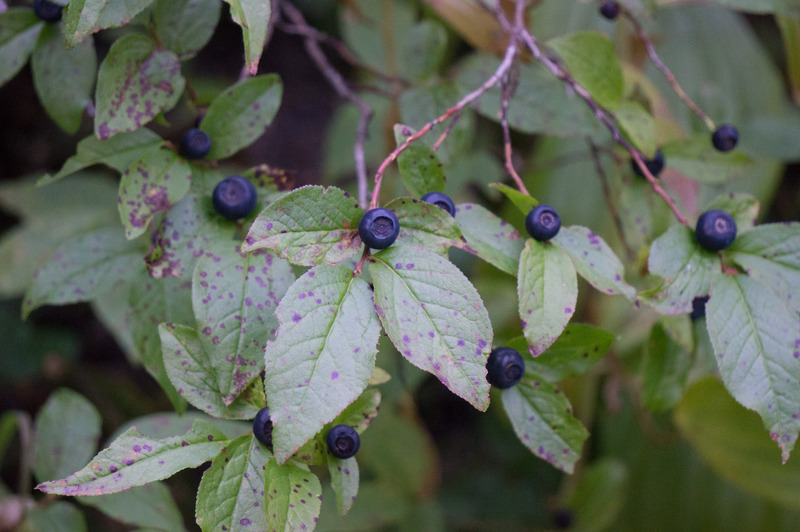 Cyanococcus, and the western (PCT) huckleberries were still trying to sort themselves out, but were mostly from sec. Myrtillus. On the trail, the eastern huckleberries were the ones with 10 large seeds in them that you find in the eastern part of the country, the blueberries were the ones with big clusters of fruit with lightish colored innards, and western huckleberries were the ones the brothers on the reservation had described to me (with bright purple innards and typically single berries). One of the interesting things I learned was that blueberries on the PCT are the same species as the blueberries on the AT. I rarely saw anything resembling an east coast blueberry as I hiked through Washington. Though there are always exceptions, it seemed like all of the know-it-alls that were so adamantly reprimanding people for picking blueberries on the trail were wrong. Up on the mountain hillsides of the PCT, almost everyone was picking huckleberries… they weren’t always picking what Montana legally defines as a huckleberry, but they were picking Washington huckleberries (huckleberries of Washington (2007)). If you are a professional huckleberry picker getting an estimated $40 a gallon for huckleberries, you should probably restrict your definition of huckleberry to Vaccinium membranaceum. However, if you are out there hiking in the mountains, with the sunshine on your back, why not enjoy all of the edible berries that sec. Myrtillus has to offer? This article in the Seattle Times talks about huckleberries and some of the issues between commercial pickers and the Yakama people in Washington. Many of the issues are the same as those that the brothers at the Warm Springs Reservation in Oregon discussed with me. This 2007 report on huckleberries in Washington is an amazing resource... It contains everything you could want to know about Huckleberries in Washington state. 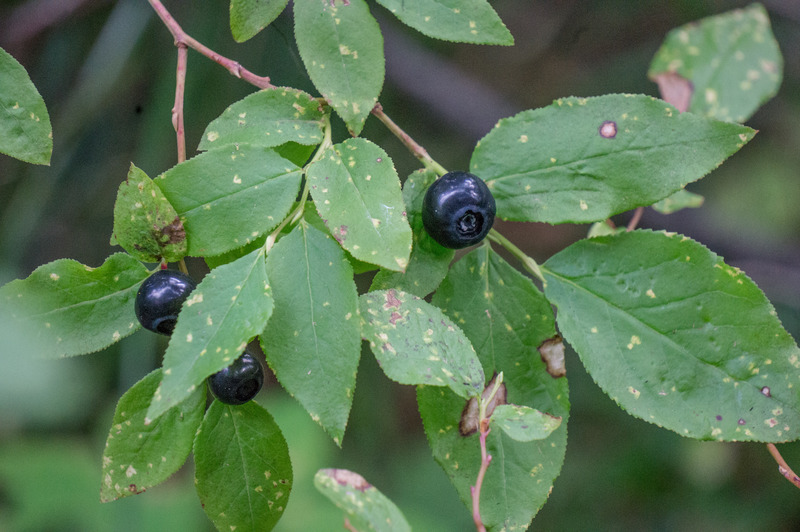 This is a guide with descriptions and pictures of some of the most popular huckleberry species. This entry was posted in Adventures, Appalachian Trail, Pacific Crest Trail, Science and tagged Appalachian Trail, blueberry, Gaylussacia, hiking, huckleberry, montana, pacific crest trail, PCT, pickers, vaccinium, washington, wild blueberries, Yakama. Bookmark the permalink. Hi, and thank you for your work! 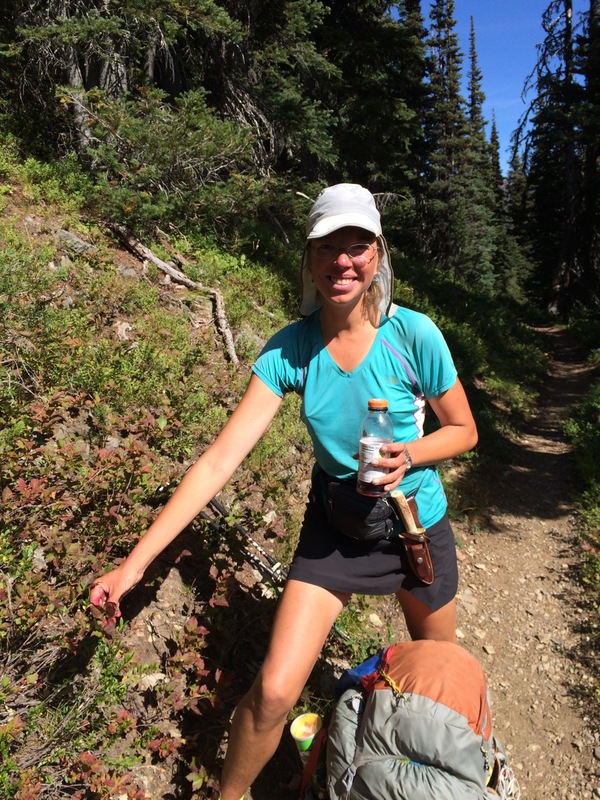 My wife and I enjoy picking and freezing huckleberries- I love them on oatmeal and in pancakes. I have noticed on our local Mt Spokane we have reddish huckleberries. They are often larger than the purple ones. Since I had not read about this, perhaps it is just a matter of ripeness? Perhaps you could shed some light on this? All of this hiking has made you glow with health! Keep it up!